Pictured from left are: Advanced Primary Health Care’s Dr. Majad Ali, MD, and Noreen Pierandozzi, NP. At right, is Alejandra, a patient who has had success controlling her hypertension through treatment. OCTOBER 2018 - Advanced Primary Health Care is a primary care practice located in Aurora, IL. Through its participation in ILHITREC’s Transforming Clinical Practice Initiative (TCPI) and Great Lakes Practice Transformation Network (GLPTN), Advanced Primary Care has shown continuous improvement in practice-identified metrics over the last two years. The practice has a patient base that is 60% Medicaid recipients and 80% Spanish speaking. It is dedicated to serving its Medicaid population even though the practice receives less reimbursement for serving these patients who are often most in need of health care. The Centers for Medicare & Medicaid Services (CMS) and many private payers are now reimbursing providers based on patient health outcomes as opposed to a fee for service model. The Illinois Health Information Technology Regional Extension Center (ILHITREC), based at Northern Illinois University in DeKalb, IL, is part of a collaborative network selected to participate in the Transforming Clinical Practice Initiative, initiated in 2015 by CMS. Kerri Lanum, Quality Improvement Advisor and Clinical Informatics Specialist with ILHITREC, had the opportunity to work with Advanced Primary Health Care and directly experience the positive results emerging from the TCPI initiative. She said helping practices reach their goals and being able to see first-hand the difference these efforts make in patient lives is very rewarding. Michele Rutishauser, Practice Manager at Advanced Primary Health Care, has worked hard in collaboration with Lanum to show improvement in clinical quality metrics and put new policies in place to revamp workflows, efficiency, and patient care. For example, the practice has successfully enrolled more than half of its patients into the patient portal, which provides increased access to health information, education, and providers despite language barriers, limited resources, and EHR vendor issues. Another important focus has been on improving hypertension clinical quality measures because Advanced Primary Care has a high percentage of patients with the condition. They have employed multiple strategies to address hypertension including, but not limited to, retraining staff in blood pressure measurement, educating providers on measure standards and patient engagement strategies, patient outreach through the patient portal, and data review through the EHR. 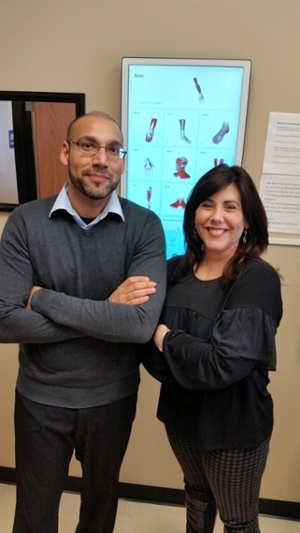 Among the success stories at Advanced Primary Care, is Alejandra (pictured above, right) who first came to Dr. Ali through a friend’s referral when she was looking for a new primary care physician. 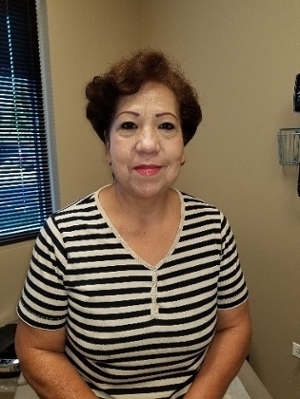 Alejandra came into the clinic with a diagnosis of hypertension that had been uncontrolled for months. Dr. Ali worked closely with Alejandra and was able to find a new medication that worked for her. He also stressed the importance of medication adherence and was able to communicate to her in her language, Spanish. He took the time to understand her history and needs. Alejandra said she is grateful she is feeling better now and can be there more for her husband and three children. Alejandra is one of the 267 hypertension patients Dr. Ali sees who are being successfully managed, with blood pressure readings consistently below 140/90. ILHITREC is part of a TCPI Grant collaborative called Great Lakes Practice Transformation Network (GLPTN) based at Indiana University that received grant funds to support clinicians across Illinois, Indiana and Michigan. The TCPI work builds on nine years of work by ILHITREC assisting providers with the adoption and use of Electronic Health Records. By 2019, 85% of health service reimbursements by CMS will be granted on value-based care. Tracking for those reimbursements starts this year. More than 15,000 clinicians across four states have joined the GLPTN to leverage direct technical assistance, resources and tools to further their quality improvement efforts and prepare for MACRA.